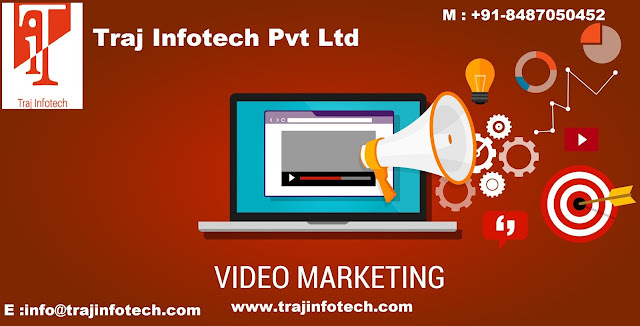 Traj Infotech: Video Marketing should be part of your marketing strategy. Video Marketing should be part of your marketing strategy. Now days, people prefer watching videos, compare to reading content. Let’s see some tips for video marketing. These days, most people have a short attention span. So, you need to come up with something interesting, if you want your audience to see the full video, then, the content should be relevant and informative, or else the audience will move on to the next video or some other video. Your video should come out with a bang and attract the attention of the audience, within first few seconds. Should use appealing images or visuals and also make your viewpoint known to others, within a short period of time. Videos can be used to help potential customers in making a decision of purchasing. Videos can explain all the steps of a purchasing process. You can use videos in the About Us page, also a good way to show the company environment or culture. Creating videos demonstrating the whole purchasing process, is a fun and intimate experience, this can be shared even with friends. The videos should be genuine and should not build any suspicion and be able to understand the brand or product or service. Passion plays an important role when it comes to selling, your products or services. Tips are very important, because with a poor video you can hurt your brand. Poorly created videos can have an impact on your brand. Need to work towards the creativity, of your video marketing. You can begin with publishing even simple videos, with good quality. Video marketing is not tough it is a simple way that builds a lasting connection with your audience. An original, creative, impactful and appealing video can increase the rate of conversion.